Home > Europe 2007 > Sprechen Sie Espagnol? The police came and burned my cave. But it’s OK, they didn’t burn my guitar or my kevlar. My understanding is that it is rude to mention the The War to the Germans, so I am striving to avoid insinuating invasion, connoting conquering and certainly blurting "blitzkrieg", but it is hard, I tell you, hard, when, in the furthest reach of Spain, a small island off the coast of Africa, I am surrounded by men and women calling after their tow-headed little ones in the guttural chop of Deutsche. We have been here close to a week and have yet to meet another North American. 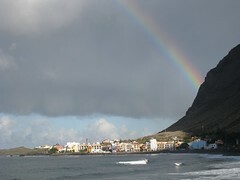 Yes, La Gomera is La Germanita. Ernst, we need you! As a vacation spot for sun-starved Europeans, the Canary Islands make brilliant sense. By far the southernmost reach of the EU, this sub-tropical volcanic archipelago is perennially warm, rarely dipping below 60°F on winter nights. Why the Germans in particular have made it their haus away from haus, you’ll have to ask the blond, leather-skinned hippies living in the hills. Probably, though, it has something to do with the mountains. While the jungle-like laurel forest is unique, the towering peaks and diving valleys must remind them of their beloved Bavaria. La Gomera is ringed with sharp-rocked cliffs and has only a handful of swimmable beaches (one of which we have settled ourselves 100 m from, and on which I type these words), but the center is an alpine roller coaster. Every day, the streets and hills are filled with Germans, young and old, in boots and backpacks, collapsible walking poles wrapped around wrists. Our hike Thursday, for example, started us in the cloud-clenched mountain-top of Parque Nacional de Garajonay in the midst of a forest that would, with its lush wet greens, make the Hoh Valley seem like Sahara (which, by the way, has spared us the choking clouds of dust it occasionally sends this way). The Canary Islands have the last bit of laurel forest that covered the Mediterranean up until the last ice age and La Gomera’s is the biggest, and it is choke full of species found nowhere else, notably succulents. Descending from the forest, you move through many different ecosystems in just a few hours: moss-wet laurel gives way to low, dry scrub gives way to banana palm clad coast as your legs tire of down, down, down. Old, stone houses dot the paths and goats, chickens and sheep wander freely. The town we’re staying in, Valle Gran Rey, is small and charming, as well. The living is cheap and easy, and rolling a close second in population to the Germans are the hippies (albeit often German hippies) that have made the beaches their home. In a delightful surprise, theft seems virtually unknown and there is no panhandling or hawking. With food cheap and the beaches comfortable for sleeping, not much is needed. Instead, days are spent bodysurfing and lounging and the evenings are filled with juggling, music, and laughter. We’ve met a few folks, since we arrived last week. Some hikers we fell in with on our walks or whom we picked up hitchhiking, as well as Marchello, a talented self-taught (from watching videos on YouTube!) firespinner (who had never heard of Burning Man, we were shocked to learn). Marchello has been living on the island off and on for a few years, and until last year lived, along with a large community of hippies, in caves on the south coast. Apparently, though, a criminal (not from the community) tried to use it as a place to hide, and the police decided to clear it out, so after decades of living, the caves were emptied and destroyed. He seemed sanguine about the whole experience, though, thankful they chose not to burn his guitar or poi.